So you think that you have actually given your all when it comes to work, but how about a desk that has actually clocked up way more mileage than you ever had throughout your 30-year career? The Mini Desk takes one of the most iconic vehicles in the last century, merging it with office functionality to produce a piece of furniture that will definitely set tongues wagging the moment anybody lays eyes on one. This Mini Desk is hand built from scratch, where one half of the Mini is left intact, while the interior is stripped and replaced with a fully functional working desk. It is also nice to see the creators add a subtle touch by throwing in a number plate that reads “Mini Desk”. By far it is not the smallest desk available, but trust designer Glynn Jenkins to come up with something special. This is a highly customizable desk, as you can choose from the top of your choice, ranging from leather, wood, and metal to virtually any color vinyl. 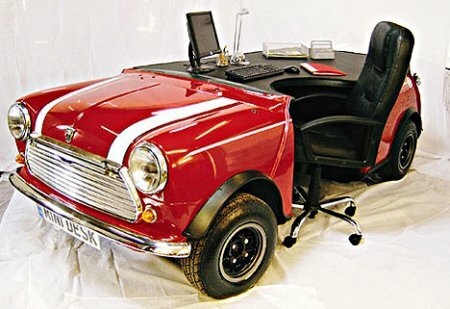 It doesn’t really matter what type of office set up you’re looking at as the Mini can be sprayed to complement the working environment instead of the other way round that is often the case with other furniture. The Mini Desk also boasts fully working headlamps, hazards, and spotlights. This means you can now signal your colleagues opposite you whenever you spot the boss coming down the aisle. If only the horn was included – it would’ve made a great stress reliever. Additional functions include a stereo set that has been integrated into the dash and speakers in the parcel shelf. The choice of rims and tyres are also left entirely up to you, so why not take this opportunity and bling out a piece of furniture? There is no mention of pricing on the product page, but I’m guessing it won’t come cheap.